Power Kite Forum - WOW, can you believe it? Author: Subject: WOW, can you believe it? For the lucky 3 guys, (members of NAPKA) at WSIKF this year the beach is open from the south end of the peninsula to the north end. Some 15 miles of buggy heaven. Holli(the woman running the festival and the kite museum) applied for and got a special event permit for us this year to run the entire beach. Dam woman you are the best. 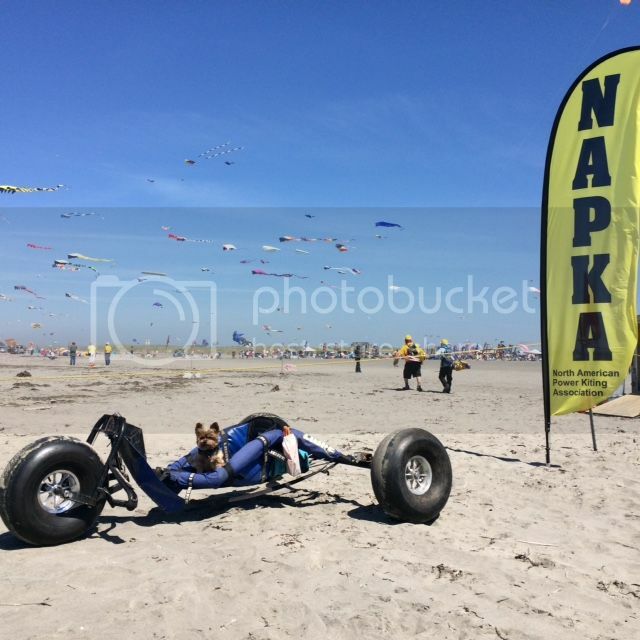 NAPKA is up front this year with a special roped off area just off the main venue area to talk about, demonstrate, race, play, show off, everything kitebuggy to the public and anyone that has eyes to see those big kites and buggies zoomin all over the beach. Rich Miller came up with the great colors and design of the new NAPKA banners That we are proudfully displaying at the corners of our area. Evans Fletcher along with Morrie Williams has worked with the kite museum and the WSIKF community to make our presence more "in your face and up front" for the public. I came along for the ride, haha. for instance, yesterday we started out with an onshore wind and 15m kites and ended the day being blown out. Man those 2m kites sure are fast suckers. I have been to this event for some years and have seen the truly rotten side of people and organizations trying to stop this event and the sport to what has materialized this year. Killer beach, Great people, Awesome city workers, what more can a group of buggiers want? Next year, our own porta potty. I sent Rich a picture of the event yesterday and his response was "looks real nice". I could hear the jealousy 3000 miles away. Hey Rich, 3 more days. and the banners are sweet, they will look even sweeter in October at WBB. Theirs even talk of the Kite Museum sponsoring NAPKA to block off the beach for some real European style races. I cant wait. NON OF THIS WOULD HAVE HAPPENED IF IT WASN'T FOR THE ORIGINAL FOUNDERS OF NAPKRA AND THE CONTINUING EFFORTS OF NAPKA. So I want to say "Thanks Guys. It sounds like things are heading a positive direction. Thank you to everyone who worked hard to make this possible. It's good to have good exposure for our power kiting community. Be safe ,have fun Brothers ! Thanks for the report. I hope to go next year. Jeff, very glad you guys are having a great time, and having an extended beach to play on! So glad to hear that things are getting a little better out there. There was a lot of input from several of us on getting those flags fine tuned and a lot of leg work on your part, glad they worked out, and yes they are sharp! Can't wait to proudly fly them in October. If I was only a little closer, I would be there without a doubt. I really need to force myself in to the buggy seat more often! Very proud to see that NAPKA is still growing and getting great support! Glad to be part of the show! Was in the 90's today, can you say HOT HOT HOT? Levi was spread eagle in the surf, had to yell a couple of times to get him to get up and run when the sneaker waves came in. That is a beautiful sight! I'm glad that you guys are having, and are able to have, a great time.